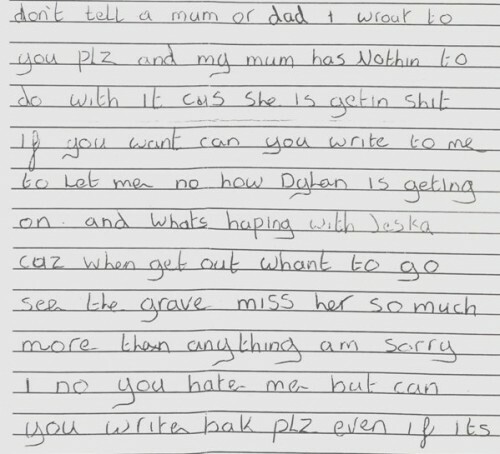 This is part of a letter written by Stewart Blackburn (who was found guilty of the murder of his girlfriend) which I was asked to analyse for a Scottish newspaper on behalf of the murdered girl’s family. Stewart Blackburn set fire to his girlfriend and locked her inside a room. She was rescued but suffered severe burns and died later of her injuries. The writing, on first investigation, is childlike and immature in its formation. It is a combination of printscript, misplaced capitals plus text messaging, which may explain the poor spelling throughout, although generally it would appear that the writer is not well educated. This sort of combination of letters shows very little rhythm and is often a sign of emotional instability and unpredictability. Many psychoanalysts believe that an individual’s emotional growth goes through a number of stages. The first stage is referred to as the oral stage. During this period, the child is totally self-centred. The whole world revolves around him and his whole focus is on the satisfaction and gratification of his immediate needs. If he stays rooted in the oral stage, all his future behaviour will subconsciously reflect what he learned during that stage, for instance tantrums, crying and outrageous behaviour in order to gain attention. Is Stewart an oral writer? Oral writing tends to be round with medium to heavy pressure. His writing is definitely round and the pressure (which can’t be detected accurately from a scanned image) shows inconsistencies. Pressure has been applied with more force on certain letters. In terms of compensation for the love he has been denied, the writer is likely to emphasise the middle and lower zone. Stewart’s writing has a large middle zone with a variety of lower zone descenders. Mid zone dominance represents a strong need for immediate gratification. He is immature and likely to act first and think later. The height of his midzone letters is inconsistent suggesting mood swings. His lower zone is especially interesting. None of the lower zone loops of ‘g’ and ‘y’ return to the baseline. Many of the finals are feathered and jagged. When there is an extreme leftward trend (as shown) it usually means there has been an incomplete mother bonding stage. The writer is likely to have unresolved issues with his mother or mother substitute. There are sufficient examples to suggest that this is a strong feature of his character. An oral character fears abandonment and loss of love. Stewart’s writing has wide word spacing which indicates social isolation from others, either self imposed or imposed on him by the rejection of others. He is lonely and fears being alone. He doesn’t want to lose the thing he loves so tenaciously hangs on to what he has.